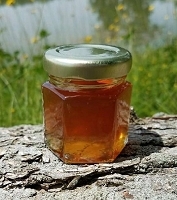 The containers are made of a nice clear plastic and will not shatter. They have a wide mouth opening for easy access to the straws. The lids are easy twist on lids. Containers measure with Lid: 3.25" x 3.25" x 7". 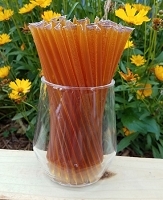 The honey straws are 6.5" tall and fit these containers perfectly. Each container will hold 100 straws nicely. These containers are unlabeled so you can label them how you wish! They will fit on counters nicely or set up easily for markets. 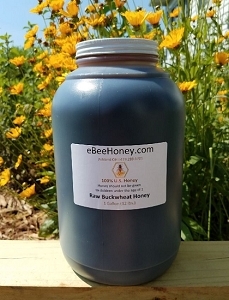 If you order multiple containers without any honey sticks, we may have to call for additional shipping since these containers are so light and take up quite a bit of space, so if you plan on ordering a bunch of these, please call us first. Shipping carriers not only charge for weight today, but also for box dimensions. These containers are not heavy but they will take up a lot of space.